On Saturday, April 28, at 1 pm, Archbishop Alexander Sample will celebrate a Solemn Mass in the traditional rite at the high altar of the upper church of the National Shrine of the Immaculate Conception in Washington, D.C. 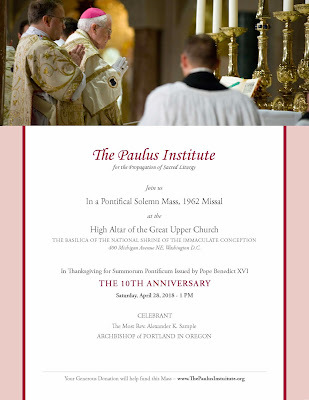 The Mass is sponsored and organized by The Paulus Institute for the Propagation of Sacred Liturgy; it will be broadcast live and worldwide on EWTN. No tickets are required to attend in person. The sacred ministers will include two diocesan priests, four from the Priestly Fraternity of Saint Peter and two from the Institute of Christ the King. Dozens of other clergy will attend in choir, and women religious will sit in the front pews. The choir of the basilica will sing Victoria’s Missa Salve Regina as the Ordinary, and several Renaissance polyphonical motets by Palestrina, Ugolini, Monteverdi, Clemens, Manchicourt and Marenzio. The propers of the Mass will be sung by the St Mary Mother of God schola from Washington, D.C. Several preludes will be sung by guest choirs, including one from the Lyceum School in South Euclid, Ohio, and another choir from Saint John the Baptist Church in Allentown, New Jersey.